Back in the day studio groups generally had gallery spaces to either show their own members work or do ‘swapsies’ with other groups. As such ‘Curation’ was a lesser used verb. Times changed and from the nineties onwards the rise of the Curator was mimicked by profile savvy studio groups. With this model artist’s groups invite bigger fish into their smaller ponds. When handled well this boosts the status of the studio from local to international in one fell swoop. However with some artist run spaces I have been left wanting beyond the logo. Shoe box spaces, open half a day a week, showing factory seconds from the art world equivalents of Nike. I kind of get it, but it feels a bit hollow. As a space Backlit has very much entered into the curatorial arena by showing a substantial range of artists from other countries. I was drawn to this preview in particular by a gorgeous project image. On entering I encountered a video of the work featured online. A lovely work, but only documentation none the less. At this point I really hoped this wasn’t all that was on offer. Thankfully this was just the warm up for the main act. A newly commissioned kinetic work by Zimoun called Rotations. You approach this by going through the artist’s boxed off spaces. I kind of liked this as it puts the process of an art-space firmly at the forefront to the visitor. Rather than purporting to be gallery with bolt on spaces. Entering the project space I encountered a delightful grid of slowly rotating, vibrating tall cardboard boxes. As I write this sounds pretty banal. But trust me, this piece is anything but banal. I was encouraged by a studio artist to watch from the side and from this aspect the whole room appeared to be shaking. This was spatial dislocation with a curious, gentle and warm embrace. Redolent of the best Richard Wilson can offer. The scale of the work was substantial enough to call a mass when writing about it. The space, was also refreshingly un-pokey. The artist’s embrace of the anti-aesthetic rough and ready décor combined with low brow media, to create a sublime almost magical entrancement for the viewer. Not that I was on a downer when I entered the space, but it sure as hell lifted my spirits even further, just by spending some time with it. This deceptively simple animation of the everyday and hum-drum, was in its primary encounter, an utter joy to behold. This is not the first delightful ‘low brow’ art to emerge from Switzerland and I was immediately reminded of Fischli & Weiss and Roman Signer. 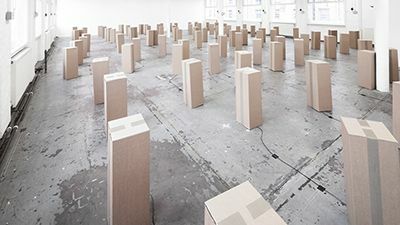 Like these mega forces of daft inquisition, Zimoun has a spirit of play which is close to the childhood wonder that drew most of us to the subject in the first place. That play which sadly gets lost in many by the time they’ve been out of art School for a few years. This is wholly celebratory and un-cynical work. It makes no pretences at crow barring theory into content. It is work that is simply glad to be alive, so to speak. But it is work of substance. Yes it engages, but it skilfully avoids mere escapism or the banality of entertainment by its raw media choices and pared down execution. Significant effort must have gone into this securing of both the artist and the project and hats off to Backlit for pulling this one together. Unlike some of the more self-aware artist spaces I have encountered, this seems to me a whole hearted honest and genuine celebration of a significant artist by a studio space and its artist-curator. Motivated by a desire to stage something fresh and exciting, rather than massage the ego of the space. Fantastic! An absolute must see of a show.